Navigation: Home » Offbeat » Sports » Who Won the 2014 Sochi Olympics? The Real Story. Who Won the 2014 Sochi Olympics? The Real Story. Let’s discuss the 2014 Sochi Olympics and who won. Who Won the 2014 Sochi Olympics? 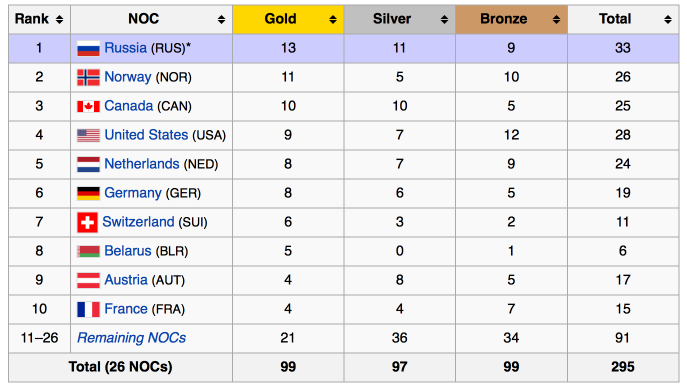 Russia was the absolute count winner and dominated both fronts: 33 total medals and 13 golds. For my American friends, we at least won 9 golds and the “Bronze Title” with 12. Interestingly, 5 of those gold medals came in sports making their debut in the 2014 games. While countries formerly in the USSR would have made Russia’s performance even more dominant, Russia benefited from some adoptions. Notably, Victor Ahn (with a personal medal count of 4: – 3 gold and a bronze) was originally from South Korea. The US even had an unforced error, causing an athlete to play for Russia. Vic Wild – of White Salmon, Washington – won medals for Russia. The United State’s Alpine Snowboarding team didn’t back him even though he had won 4 previous gold medals for the USA. Russia won 33 medals out of 295, a full 11.2% of all medals in the 2014 games. However, their count is even more impressive if you normalize it for countries previously in the USSR. That’s a full 15.6% of all medals in the games! Combined, their medal count at the Winter Olympics is 194 + 124 + 0 = 318 medals! Add those up and they’d be second all time in the Winter Games through 2014, behind Norway. Let’s talk about the United States now. 5 of their 9 gold medals came in sports which weren’t held in Vancouver in 2010. Even more, those sports represented 5/9 of gold medals, and 9/28 in overall medals. You can call it ‘innovative’ scoring methods! Also innovative? The medal count itself. 98 events were held, but there were 295 medals rewarded. Yes, there was a tie for the gold medal in the Women’s Downhill (Dominique Gisin, Switzerland; Tina Maze, Slovenia), and tie for bronze in Men’s Super-G (Bode Miller, USA; Jan Hudec, Canada). Interestingly, the United States did best in the bobsled – winning 4 of 9 of the total medals awarded (3 of the bronzes and a silver in Women’s 2-Man). The US took home the bronze in team figure skating, but for the first time since 1936 no American individuals took home a figure skating medal. Out favorite performances of the games? We’ve got to go wonky here: Lauryn Williams of the United States and a couple of female Dutch speed skaters: Jorien ter Mors and Ireen Wüst had the most interesting games. Williams is only the fifth person in history to pick up a medal in both the Summer and Winter Olympics. She just missed becoming the second to have two golds – by a mere few hundredths of a second in the bobsled. Jorien’s a funny story – she had been a short track skater, and started long track skating only a few years back. She ended up dominating the Women’s 1500 meter long track, and picked up a team gold in the relay. Wüst was perhaps the most dominant athlete of the games, though. She medaled on that same Dutch relay team, and medaled on every individual event from the 1,000m to the 5,000m. Epic. Let’s talk about the Dutch for a second. Contrast them to the United States: The US had their third sweep in Winter history 1956 – men’s figure skating, 2002 – Men’s halfpipe snowboarding) in Men’s slope-style skiing. Not a bad showing from the US right? Not until you consider the Netherlands. The Dutch had 4 sweeps in these games. Add to that the fact that there were other Dutch athletes in the top 6. Their speed skating teams are truly awesome: 13 / 18 Men’s medals and 10/18 Women’s medals in speed skating went to the Netherlands. All that with only winning won one non long-track speed skating medal. Ironically, it came on the short track (Men’s 1000m, Sjinkie Knegt, bronze). A nod goes to Ole Einar Bjørndalen, the “King of Biathlon” and best Winter Olympian of all time (13 medals! He’s also the Olympian you’d least want to burglarize). Honorable mentions go to Charlie White and Meryl Davis, Sevn Kramer (this Sven Kramer), and a ton of respect to Yevgeny Plushenko at an “”ancient”” (by figure skating standards) 31 years old. I could bore you with a predictable performance per population ratio or another discussion about the relative worth of medals. Those aren’t fair in the Winter Olympics anyway: not every country can even train for a Winter Olympics. So, until we can normalize by population “with access to winter facilities and mountains”, it’s not worth it. On top of that, any normalizing has to work around exceptions like the Dutch. Even if you removed their speed skating medalists they’d still medal with all the remaining athletes (!). So, give the nod for winners in the 2014 games to Russia and the Netherlands. Honorable mention to Norway. US, we’re on the outside looking in this time. re: the Dutch and speed skating. Probably helps to have miles of frozen canals right outside your doorstep to practice on in the wintertime. And, having ice skating as an integral part of the national sports culture. Like badminton for Indonesians, fencing for Italians, sprinting for Jamaicans, and long-distance running for Kenyans and Ethiopians. Americans would destroy the rest of the world at commuting.